Today’s the day I click that publish button!!! Wish me luck!!! 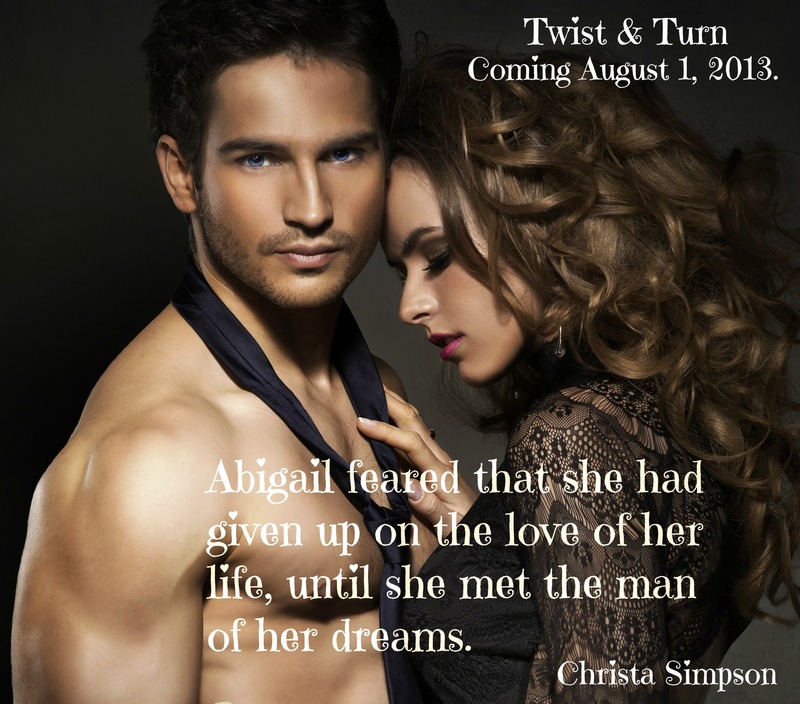 Twist & Turn by Christa Simpson. Cover by Kellie Dennis of Book Cover By Design. “I pissed you off?” he said, smirking. I got up from the couch and shoved him as I passed. I retrieved a bottle of water from the fridge and returned to the living room, relieved that I didn’t have to be totally miserable all night alone. That’s when I found Edwin sitting in my spot. He knew how picky I was about my spot. “I’ll make you alright.” I put down my water bottle and yanked on his thick-muscled arms. He didn’t budge an inch. “Edwin,” I whined. “My spot was warm. Please!” I pleaded. He sat with his feet planted firmly on the floor and his godly arms folded over his chest. I yanked and yanked, but he didn’t move. His smiled curved even higher. “You asked for it. Now I’m gonna have to lay the smack down on you,” I announced. Having too much fun to stop, I walked behind the couch, wrapped my arms around his neck and flung myself over the top the sofa. He willingly submitted to the attack and, though I may have knocked him out of my spot, I unintentionally flattened myself beneath him. “I see you got your place back,” he growled, softly. I inadvertently smiled, but secretly wished it didn’t feel so good to be wanted by him. “I’m gonna kiss you now,” he warned, as he closed his eyes. He eased closer, then fastened my lips to his with a soft and sensual caress that could only come from Edwin’s mouth. His large hands drew up my sides and cupped my bare breasts, as though he were worshiping them. “Mmm,” he moaned, as I awkwardly scrambled to get out from under him. He couldn’t wipe the wide grin from his face. “Fine! You can have my spot!” I snapped. Copyright © 2013 Christa Simpson. All rights reserved. More COMING SOON!!! Don’t forget to add my books on your Goodreads shelves!